Born in Messina, Sicily, Gino has been exposed to diverse types of music from an early age. Although not from a musical family, some of his earliest recollections are of his father playing European classical works and folk music from various Mediterranean countries on their record player, and his mother singing along to operas and popular Italian songs on the radio. Emigrating to the United States in the early seventies, at a time when jazz fusion and progressive rock were at the zenith of their popularity, he discovered the music of groups and artists like: Cream, Miles Davis, Al Di Meola, King Crimson, Lifetime, Mahavishnu Orchestra, John McLaughlin, Jaco Pastorius, Jean-Luc Ponty, Return To Forever, Rush, Carlos Santana, and Weather Report. The juxtaposition of European classical elements and ethnic rhythms, along with the finesse and improvisation of jazz and the power and intensity of rock, were musical forms that were at once familiar and brand new, creating a lasting impression on him. In the early nineties, he decided to devote more time on music and purchased his first bass guitar. Unlike many of his contemporaries who have switched from electric guitar, he chose the bass because of its tonal characteristics and the challenge of exploring the instrument's built-in dichotomy of melody and rhythm. After supporting several groups in the greater Boston area for a few years, he turned his focus to starting his own band to compose and perform original instrumental music. In late 1995, answering an ad posted on "The National Midnight Star" - then the Rush online digest - he met Dave Kulju, an electric guitarist who shared numerous influences, a love of odd time signatures, and a penchant for exploring unorthodox musical themes with him. Kindred spirit and drummer/percussionist Joe Musmanno completed the power trio, now known as Electrum, in 1996. 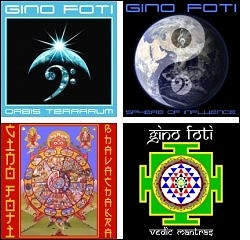 Adopting the Do-It-Yourself ethic, Gino built a home studio and started a music label which helped the group record and release two compact discs: Frames Of Mind in 1998 and Standard Deviation in 2002 to considerable success, mainly due to the strong Internet presence of instrumental and progressive rock fans, musicians, and dealers. A few months after Standard Deviation was released, Gino began working with software samplers in an effort to arrange new material for Electrum. After discovering all the ethnic percussion and instrumentation loops and samples available, he decided to embark on several solo projects that would blend all of his favorite musical styles, in the tradition of first-generation jazz-rock and world fusion artists. Simultaneously released in August 2006, his first four solo albums received numerous positive reviews from the independent music community, and over one thousand compact discs were sold within the first year - without the aid of any major distribution channels, commercial radio airplay, live performances, or social media presence. Orbis Terrarum - Exploring the relationships between diverse musical traditions and the dichotomy of rhythm and melody of the bass guitar, this aural travelogue blends intricate ethnic rhythms, spacious melodies, and flowing solos with the passion, intensity, romanticism, and introspection usually associated with first-generation jazz fusion and progressive rock artists. Sphere Of Influence - Centered around the universal "Union Of Opposites" concept, the compositions contain a dynamic balance of rhythm, melody, and harmony by integrating ethnic sonorities into his jazz-rock fusion palette. Merging diffractive musical arrangements with cohesive ensemble playing, dense percussive layers with ethereal instrumental textures, this release is imbued with both vibrancy and sensitivity, all spearheaded by his bass guitars. Bhavachakra - Inspired by the Buddhist "Wheel Of Life", this collection of ambient soundscapes, acoustic and electric textures with Asian and Indian influences, and synthesized exotic atmospheres is meant to direct the listener through all the guideposts of transmigratory existence, evoking myriad memories and emotions along the way. Vedic Mantras - Traditional Vedic chanting is combined with modern instrumentation and elements of jazz, rock, and European classical music in a variant of East-meets-West fusion. Featuring the Taittiriya Upanishad, one of the most important writings of ancient Indian philosophy, the arrangements were carefully constructed to retain the devotional mood and integrity of the sacred texts while creating a multi-genre sonic palette. A few years later, after amassing about fifty compositions - some based on old skeletal arrangements, some brand new - he decided to release two more albums in the same vein as Orbis Terrarum & Sphere Of Influence, with some modifications. The first would feature six two-part suites, including tracks with two bass guitars playing simultaneously in various configurations: fretted & fretless, dry & effected, rhythm & lead, etc., and incorporate electronica-based genres & styles into his fusion palette. The second would have no keyboards or synthesizers, and less percussion instruments overall, featuring a fifteen-minute trilogy, four duets, and an arrangement for four bass guitars of a Johann Sebastian Bach fugue. Both were released in 2013, with the compact disc format available as limited edition Digipaks. Xenosonic Journeys - A terminal point for the previous four albums, his musical compass points in all directions of the globe, with the arrangements both charted and improvised. For this release, genres & styles, like: ambient, downtempo, electronica, techno, trance, et al. are incorporated into his unique fusion of jazz, rock, and world music to navigate through exotic domains, and explore new sonic topographies. Global Resonances - Bass guitar is the prominent instrument in an integration of traditional ethnic music and modern jazz fusion influences into new experiments of cultural hybridity. An amalgam of the sacred and secular, the mystical and the accessible. With a catalog of over eighty compositions now to his credit, four digital-only albums were compiled by sub-genre and released in 2014. In addition, individual compositions were added on several volumes of world music Various Artists compilations issued by other record labels. Asian Mosaic - Like the universal Yin-Yang concept, balance, dynamism, and inner harmony are the primary features of this release. The vast cultural and geographic expanse of the continent is encompassed into fourteen compositions that fuse exotic instruments, Taoist mysticism, and Dharmic philosophy with the forms and tonality of Western music. Indian Mosaic - Carnatic and Hindustani traditions, Vedic mantras, Hindu philosophy, and additional indigenous influences are intermingled with jazz, rock, ambient, trance, electronica, and other Western genres in a fourteen-piece collection that spans the long history and rich culture of the subcontinent. Latin Mosaic - The infectious pulses and unbridled passion of the diverse rhythms, styles, and sounds of Latino music are blended in twelve contemporary jazz-rock fusion contexts that feature improvised melodies and solos, unconventional song forms, and an emphasis on its African roots and Iberian heritage. Mediterranean Mosaic - Twelve compositions reflecting the multicultural diversity of the lands that surround its sea. Folk and traditional music - featuring flamenco - from the western shores, and tonal systems & rhythmic forms from the eastern region are enriched with modern jazz, creating a new form of ethnic fusion that resonates beyond its boundaries. In December 2016, an album was released that incorporated chance - a device he began using during the production of Global Resonances - into the primary elements of the compositions, featuring odd-time signatures, and two trilogies: the first based on sacred geometry, and the second in tempo libero, or free time. 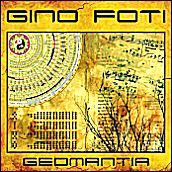 Geomantia - Conceptual album exploring the contrast between design and chance by using aleatory music via geomantic devices, including: I Ching coins & hexagrams, dice, runes, and a tarot deck. A confluence of earth divination and a unique musical vision retaining the passion, power, and precision of his past releases. 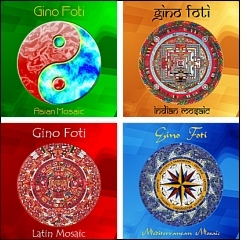 Gino decided to take a break from jazz/world fusion, and began working on six conceptual albums in the ethnic fusion, meditation, and spiritual music genres, featuring MIDI bass guitar & MIDI bass pedals, that were released between 2017 and 2019. Mystic Gleams - A musical journey through the mystical, esoteric paths of the world's six largest religions: Buddhism, Christianity, Hinduism, Islam, Judaism & Taoism, exploring their common belief of the Universe as sound. Bija Mantras - Guided meditations, accompaniment tracks, and pronunciation guides for the seed sounds/syllables of the seven primary chakras. Useful for chakra meditation, hatha yoga, kundalini awakening, tantric practices, vedic healing, and similar modalities. Panchakshara - Two half-hour compositions: 108 repetitions of the mantra Om Namah Shivaya, backed by bass guitar and sitar; and a piano piece that blends modern Classical, improvisational jazz, and themes influenced by devotional Indian music to Shiva. Breath Of Vishnu - Indian mysticism merges with modern instrumentation in a long-form composition, performed in real-time. An organic complement for yoga, contemporary meditation techniques, and other counterparts. Ghiza-i Ruh - Inspired by the writings of Hazrat Inayat Khan, Indian, Mediterranean & Middle-Eastern music, this hour-long composition is both cyclical and elastic, like the traditional Sufi whirling dervishes. The Darkness Conscious - Inspired by the writings of Carl Gustav Jung, this composition blends elements of Baroque chamber music, film/soundtrack, new age, and symphonic classical with meditation music to help "... kindle a light of meaning in the darkness of mere being".